You know how it is: You’re a world leader on the move, juggling tweets, calibrating handshakes for maximum awkwardness, and occasionally paying lip service to the work of international diplomacy. But you’re also a dad, hoping to give your beloved daughter the empowerment she needs to be a success in life (no matter what the haters at Nordstrom say). What better way to counteract all the negative messages about women floating out there in the world—many of which you, yourself, are personally responsible for—than to let her sit at the big table at a meeting of the world’s most powerful people? CNN reports that this heartwarming tale is exactly what happened at the G20 summit this morning, when U.S. President Donald Trump briefly ceded his chair to his daughter Ivanka. (Trump had to leave the table, possibly to sling some more vitriol at women suing him for calling them “liars” for saying he sexually harassed them.) 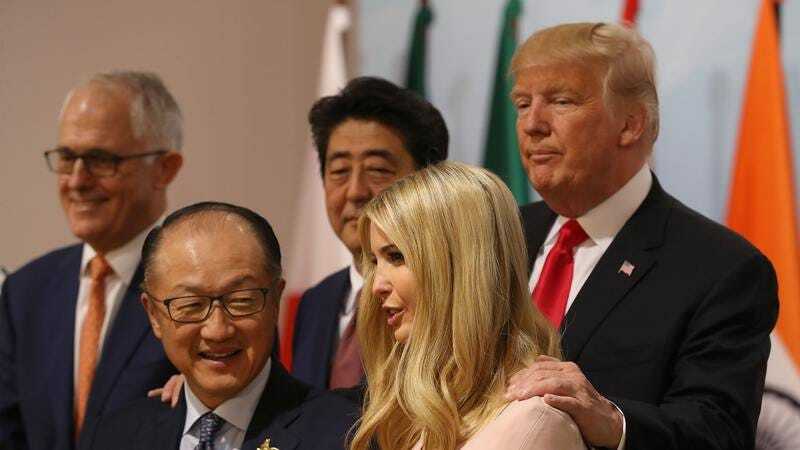 The White House contends that it’s standard G20 practice for advisers to sit in for heads of state when they have to step out, although relatively few of those aides are the politically inexperienced children of the president or prime minister in question. Still, far be it from us to cast aspersions on a beautiful father-daughter bonding moment, especially since Trump is clearly grooming his daughter for higher things; he took time out before today’s session to heap even more praise on her head, calling her pretty much perfect. (“If she weren’t my daughter, it would be so much easier for her. Might be the only bad thing she has going, if you want to know the truth.”) That boost to her self-esteem—and those connections with fellow world powers—will presumably serve her well when Ivanka I become’s America’s first fashion designer/jewelry mogul/un-elected empress-for-life.